While I mostly write/cover/listen to 'Rock' it isn't always like that...I just DL'ed 5 Miles Davis early 80's CD's this week and I was shown some new underground hip-hop that I love. Check out Hip Hop Linguistics track of the week featuring Jake Lefco, IllSpokinn, Ryan-O’Neil, Kats and Domer. In full confession I am friends with Kats and will be reviewing his newest release "Levitate" in the upcoming days, but friendship aside this is a smoking track. 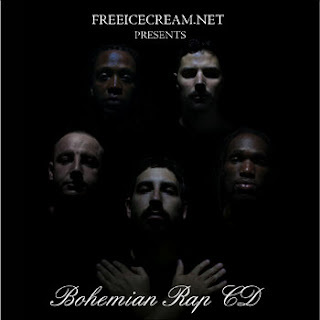 You can get a bunch of great underground hip-hop by going right here to Free Ice Cream, it is a booming site run by fine folks, and it is all free! Give it a gander.